Tanner Vavra began his athletic career at Menomonie High School. After dominating the Prep scene, the middle infielder took his passion for the game to the collegiate level. Through his freshman and sophomore years, he mashed to an average of .407 and .421, undoubtedly leading the MATC Wolfpack to the NJCAA World Series in respective seasons. From Madison, he took the next step at Division 1 Valparaiso University. To no surprise, He then lead the Crusaders to back to back conference championships and 2 NCAA Regional appearances, toting whopping averages of .332 and .330. In the summer he would continue his offensive success leading one of the top college leagues in the country, the Northwoods League, with a .381 average while collecting mid and post season all-star accolades. This leadership and determination got the attention of the Minnesota Twins, who selected him in the 2013 MLB Draft. Tanner would play for three different Twins affiliates over the following four years. With them he would be awarded the Harmon Killebrew award in back to back seasons. After the Twins Tanner would move on to the St.Paul Saints and Sioux City Explorers for two seasons. During the winter of 2015-2016 Tanner traveled to Australia to play in the Australian Baseball League. Here he would become a mid-season and postseason all-star while hitting a solid .310 mark. If all of his accomplishments haven't got your attention, his perspective of things might. Tanner has accomplished all of this things without the vision in his right eye after two separate accidents. Eight surgeries later, Tanner is unable to see out of the eye and has used this as a platform for other players with a disability of any kind. Tanner has shown his leadership qualities, and passion of the game throughout his playing career. After years of giving private lessons and camps he decided to take his coaching to the next level, accepting a job as Assistant Coach at the University of Saint Thomas. A fun-loving and compassionate athlete, Trey enjoys passing on his knowledge in a simple and entertaining manner. He enjoys the opportunity to work with every athlete, regardless of talent or current skill level. Although being known to play multiple position and hit in all places in the lineup, Trey primarily handles "middle of the order" hitting and corner infield/outfield. Trey currently plays for the Chicago Dogs of the American Association. Terrin is the youngest of the three brothers. He also began his playing days in Menomonie. Terrin quickly became an important part of the MHS program making the Varsity team as a Freshman. He went on to achieve 4x Big Rivers All-Conference Selections, Big Rivers Conference Player of the Year Selection, 2x All-District Selections, All-District Player of the Year Award, a First Team All-State Selection, and Leader Telegram All Area Athlete of the Year. His success at MHS earned him a scholarship to play at the University of Minnesota. There, his success continued right away. He quickly earned the starting shortstop position and ran with it. 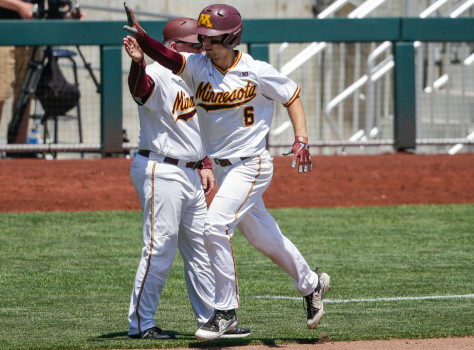 In Terrin’s three year career for the Golden Gophers he had a .351 career batting average, 98 RBIs, 13 HRs, and a .969 fielding percentage. He also propelled his team to 2 Big Ten Conference Championships, 2 Regional Appearances, and a Super Regional Appearance. Vavra’s success earned him First Team All-Conference in the Big Ten, and First Team All American honors as well as being named Team MVP in his junior season. He was a 3rd round selection (96th overall) by the Colorado Rockies in the 2018 MLB Draft and is currently living out his professional dreams. Terrin loves to share the knowledge that he has learned throughout his career and we are proud to have him as a part of the Triple Threat Training Team.